A really important part of manifesting the life you want is, of course, figuring out exactly what it is you want in your life. Another really important part of that clarity is to let it go. Don’t be. It’s not complicated.The truth is manifesting the life you want is, in fact, pretty simple. Of course anyone telling you that simple=easy is either drunk, confused or about to sell you some snake oil. Once you figure out what you want, you know – the big picture, you must let go of the details of how that’s going to come to pass. Let me explain with an example. It’s a bit of a vulnerable personal tale, but I think it shows exactly what I am talking about. So, this past new moon, I was in meditation and asking for help with an intention for my own life that I was struggling with. I had put it out there weeks before and it wasn’t happening and I didn’t understand why. The truth is I was getting frustrated and a bit impatient. Not exactly going to raise my vibrations to match my request with that, so I was mediating on it. I have been trying (geesh, just typing that word ‘trying’ should have told me something!) to find a local group of people who are like-minded and who I can get into those really deep, beautiful, life-changing type of conversations with. I have that…but not locally and so my in-person contact for this was something I really desire. Now where I live, not the easiest thing to do. Again, not going to get side-tracked with the specifics. However, I had some grand ideas about HOW this would (read ‘should’) happen. And cue the ‘aha’ and d’oh moments! No wonder it wasn’t really happening! I was ‘shoulding’ all over and that emotion/action/thought is totally REPELLING the very thing my soul was craving! I needed to let go. So I asked, set intentions, wrote out my desire and mediated on it. And I let it go. Faith is the muscle that we strengthen by using it when it’s most difficult. Less than a week later I was in a little crystal shop I’d visited more times than I could count. This was on an early weekday morning, and I’d normally not be able to wander by at at time like that because I’m busy hustling right? A person I’d not seen before was behind the counter. She was so warm and friendly! Short story, we started chatting and about half way through both of us were tearing up, connected and in the end a hug followed. She (are you sitting down for this?) is a practitioner of reiki for animals, from Italy, who knows the area I grew up in, which is across the country. We shared pictures of our beloved dogs, we talked about four-footed angels, our deep beliefs and then…she asked if I knew about the Women’s Circle she hosts in her shop. Um…no – but I’d LOVE to! For real you guys! This JUST happened a few days ago. This was not how I had envisioned things unrolling. I was looking in the places I expected to find groups gathering. Never in my dreams did I think that talking about lepidolite stones would lead to this sort of beautiful connection in a shop where we ended off talking about the evolution of the souls of animals! I mean seriously! The universe is REALLY good at arranging some pretty crazy ‘coincidences’ in order to give you what it is you are asking for, if you bother to raise your energetic vibrations to match the ‘thing’ and stay open. Basically, what my own teacher says “Ask, Believe, Receive” is all you need. 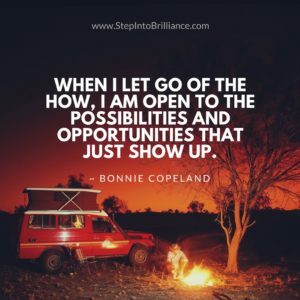 Because, when I let go of the how, I was able to be open to the possibilities and opportunities that just showed up. And show up they did. If I had stayed stuck on the ‘how’ I expected to find a local, in-person tribe, I’d have continued feeling frustrated at not finding what I was looking for. So, ya. I knew what I wanted and how I would feel when it arrived. But I had to let go of knowing HOW it would show up. Leave the details to Source. The infinite wisdom of the universal consciousness can see so many more possibilities than we can. Don’t block that by demanding things show up in only one possible way. Time to start carpe-ing the Hell outta this Diem and manifesting/building the life we WANT. And I’m right there with you!